6 + 7th FREE (1 x each chakra color). 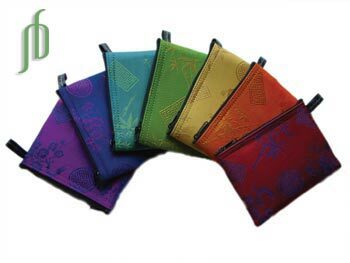 Silk zip purses can be used as jewelry gift bags and as zip coin purses. 3.5" x 5", made of beautiful soft silk and lined with black foam for durability. 100% silk. Made in Vietnam. Sterling silver chakra pendant set with 7 free ultra suede bands (vegetarian, not pre-assembled) so you can tie them as a chakra necklace.